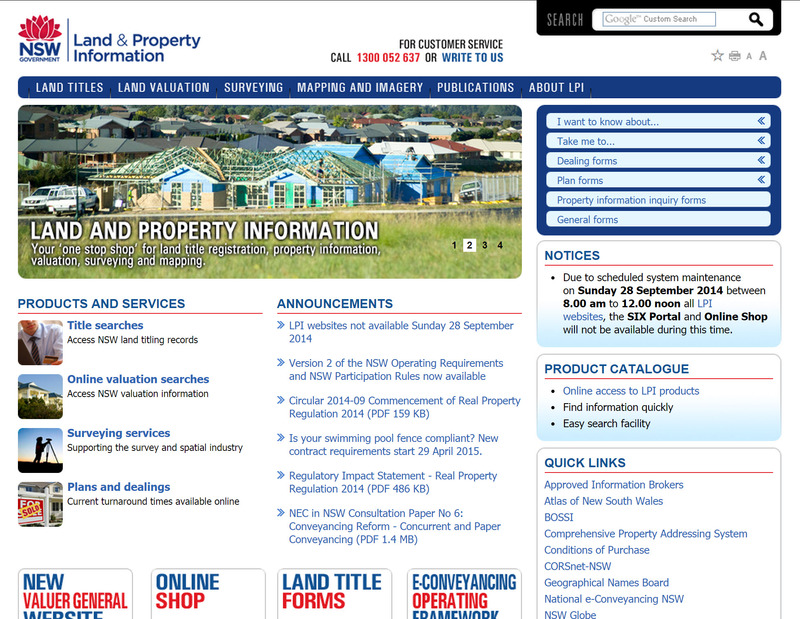 The government department responsible for NSW land administration is currently called Land and Property Information. Here is a brief list of links to the most important websites for family and local historians. What do you know about the house you grew up in? I wonder how many of us lived in the same house all through childhood? I didn’t. I lived in four different houses from when I was born until I finished school and left home. I don’t remember the first one; I was too young and we weren’t there long. The first house that I remember was in Carss Park, in southern Sydney. It was underneath the flight path and I remember planes flying over and scaring my younger sister. It was close enough to the local school that we could walk, even at that age, and we had to climb up a rocky lane through to the street behind to get there. It had a great backyard for kids to play in, and a patio with crazy paving that we used to roll marbles on. Looking at it now on Google Maps I can see it has a swimming pool and most of the yard is gone. It seems much bigger, taking up the full width of the block, although I can see the flat roof of the garage so that must still be there in some form. I can also see the lane seems to be a smooth, grassy strip, not at all how I remember it. The 1943 aerial photograph shows that the house was there even then. The houses I remember behind and above ours had not yet been built, nor had the house of the old lady next door. It’s hard to tell but it doesn’t look like the garage was there either, although the back garden looks to have been laid out in a circle. I also found a real estate advertisement for the property, showing a picture of the front of the house and the backyard, which I’m not going to show you for copyright reasons. The house looks totally different, without that rounded front you can see in the family photo at the top. The back yard looks totally different, too; it looks as though they’ve levelled the terracing to put the pool in. Nowhere for kids to play – it looks like somewhere for adults to ‘entertain’ now. I’ve recently traced some of the history of the property and now I know that the name Carss Park came from the original owner of the property. It was subdivided in the 1920s into the blocks and streets that I knew. My mother has told me some of our history in the house. We moved in after a year in Melbourne that didn’t work out. My little brother was born while we lived there, and then my parents split up and Mum sold the house and we moved to Dubbo. When I ordered copy of the title I found out some more. My mother bought the house in her own name in 1960, before we moved to Melbourne. She immediately took out a mortgage, which most of us do. So the house must have been rented out while we were in Melbourne, and they would have had to get the tenants out when we decided to come back. She sold it after we had moved to Dubbo, which makes sense – she bought a house in Dubbo after we had lived at Gran and Pop’s place for a while. Unfortunately, titles don’t have sale prices on them. For that I have to look at the individual dealings. One day I will; I would love to know what Mum paid for the house and what she got back when she sold it. Have a look for the house or houses you grew up in. Not only will you learn something about your family, but it will bring back memories of the houses and your family living in them. This post was originally published on my old blog Genealogy in NSW in April 2013. I still haven’t purchased copies of the dealings to see how much Mum paid for the house! Rates assessments can tell you a lot about the owners and renters of land. The content varies between councils and over time but at the very least you can see who is living in the property, the type of building, and the value of the land and improvements. You can check subsequent books to trace changes in ownership and tenancy over time. This information is particularly useful for the early 1800s if your ancestors were not eligible to be enrolled to vote, either for property or gender requirements, or the early electoral rolls have been lost. They can also help in tracing land ownership for pre-Torrens Title land where Old System deeds have to be found one at a time. The image above has been taken from the City of Sydney Council Rates Assessment books 1845-1948. These books have been transcribed and indexed, so that you can search for a surname or street name, and bring up a list of results. When you click on a result you get a transcription of the page, and if you scroll further down the page you can see an image of the original page. The little square in the middle of the page is the magnifying glass that hadn’t yet opened. Even back then in 1848 we could see the name of the resident and the name of the owner. In those days the occupier was responsible for paying council rates, and so both are listed. We can see the type of building; what it was made of; what the roof was made of; and the number of floors and the number of rooms. For the Newtown books you need to know which Ward your street was in. There are maps to help you identify the Ward. You can then select the book for the Ward and the year you want and search the PDF yourself. House numbers Most properties did not have house numbers in the 1800s. The house number column in the assessment books refers to the number of the house in the book, not in the street. Street names may have changed since the books were compiled, particularly in the inner cities. Surnames may be spelled differently from one year to the next, and given names may not always be shown. Tenants’ names may be less than informative, with names such as ‘Bob the Jew’. Most local councils have kept their rates assessment books, although they probably don’t go back as far as this. They may have been microfilmed and made available at your local library, or they may have been deposited with State Records NSW. If State Records or the local library doesn’t have them check with the council. Image: Sydney City Council Archives, CSA027377-056, 1848 Sydney Place. Researching New South Wales land ownership is complicated by the changing regulations and historical events of the time, and it pays to know what regulations were in force at the time of purchase or transfer of ownership. Here is a brief timeline of the land regulations and events that affected land holders at the time. 1788 – First settlers arrived in Sydney Cove. Governor Phillip was empowered to grant 30 acres of land to freed convicts, with an additional 20 acres if married and 10 acres per child. 1789 – Non-commissioned officers and privates were entitled to receive an additional 50 acres to encourage them to settle. 1792 – First free grants of land were made. 1810 – Many land grants had been made before Governor Macquarie’s arrival to replace the deposed Governor Bligh. Macquarie revoked many of these, although most were reinstated. 1825 – Orders received for a general survey of the 19 Counties of the Colony. Introduction of fees for large grants of land. 1826 – Land could only be taken up within the ‘limits of location’ within the 19 Counties. 1831 – Free grants abolished; land had to be purchased through public auction. 1833 – The Encroachment Act allowed for the appointment of 13 Commissioners of Crown Lands in an attempt to curb the settlement of Crown land (squatting) outside the 19 Counties. 1834 – Survey of the 19 Counties completed. 1836 – First act passed to formalise grazing rights beyond the 19 Counties for leases of £10 per year. 1847 – Colony was divided into Settled, Intermediate and Unsettled categories, with leases available for one, eight and fourteen years respectively. 1856 – Responsible Government granted to the Colony of New South Wales. Requests for land dealt with by Surveyor General rather than the Colonial Secretary. 1859 – Lands Department established under John Robertson. 1861 – Crown Lands Alienation Act introduced ‘free selection before survey’, or Conditional Purchases. The Crown Lands Occupation Act allowed all Crown land to be selected for purchase, including the pastoral leases of others. 1862 – Real Property Act introduced Torrens Title, a centralised, government-guaranteed, system of land title to replace the British Common Law system. 1884 – Crown Lands Act set out a comprehensive system of land tenures, including conditional leases for land adjoining conditional purchases, occupation licenses, homestead leases, and special purpose leases. Land districts were established and superceded the local land agents. 1900 – Real Property Act consolidated previous acts. Still in force today. 1907 – Closer Settlement Act allowed for land to be purchased by the government within 15 miles of a proposed railway line for division into small lots for farming purposes. Later acts followed. 1916 – Returned Soldiers Settlement Act relaxed the restrictions on the type of land resumed and allowed returned soldiers to settle on it. 1919 – Conveyancing Act established ‘good root of title’ for Old System land, requiring only a thirty year chain of title instead of all the way back to the first land grant. 1941 – War Service Settlement Act allowed for land to be set aside specifically for servicemen or ex-servicemen. A training certificate had to be obtained before land was allocated. 1961 – Strata titles commenced with the Conveyancing (Strata Titles) Act. 1975 – government reorganisation brought the Torrens Title (Land Titles), the Deeds Registration, and the Crown Titles Branches into the Department of Lands when the Registrar-General’s Office was transferred. The name of the Land Titless Office has been changing ever since. Hepburn, S. Real Property Law, 3rd edition. Pyrmont, NSW: Thomson Legal and Regulatory Australia, 2008. NSW Department of Lands, A Guide to Searching New South Wales Land Title Records in the Queens Square Office of Land and Property Information Department of Lands – User Guide – Searching the Records of the Registrar General. Sydney: Department of Lands, 2008. NSW Department of Lands, From Crow Quill to Scribbling, History of Pre Computer Mapping, Lands Department New South Wales. Sydney: Department of Lands, 2005. Ryan, R.J. (editor). Land Grants 1788-1809, A record or registered grants and leases in New South Wales, Van Diemen’s Land and Norfolk Island. Five Dock, NSW: Australian Documents Library, 1981. First published by Keith A. Johnson and Malcom R. Sainty, 1974. State Records NSW. Archives in Brief 93 – Background to conditional purchase of Crown land. State Records NSW. Short Guide 8 – Land Grants, 1788-1856. The First Stop Guide is the first of five publications that detail the history of and information about searching and accessing land titling records in NSW. This guide aims to be your “First Stop” in helping you decide which publication(s) suits your particular searching needs. This publication offers a brief history of the Office of the Registrar General since its inception in 1843 and the records it holds which date back to 1792. It also describes how land was initially acquired and consequently managed. This guide explains the intricacies of Old System land title and offers advice and tips on how to search the indexes and documents that have been registered with the Registrar General since New South Wales (NSW) was founded. 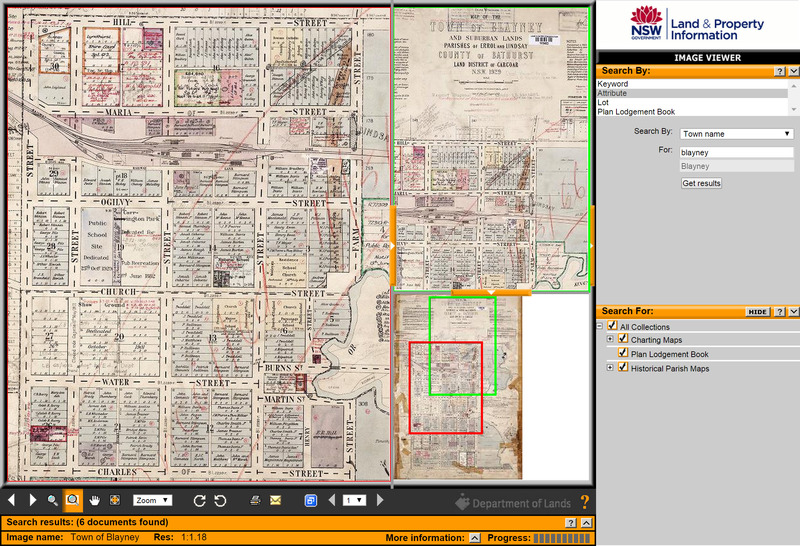 This guide has been prepared to provide a reference guide to Land and Property Information (LPI) mapping and plan resources and as a research tool for historical inquiry. This guide describes how Torrens title information has been recorded historically and offers practical information on how to locate current and historical Torrens title information. I haven’t examined them in detail as yet, but on first inspection they appear to be much more manageable and more concise than the old ones. The Old System Information and Search Guide is 45 pages and is much clearer and more friendly than the old 148-page User Guide to Old System Searching published in December 2009. No comparison really. The descriptive text appears to be the same, at least in the first few pages, but the explanations are much clearer. I recommend you go and find these guides if you have any interest in land and property in New South Wales. Researchers from other States are also likely to find the explanations useful, as the types of land records are similar in all States. Conditional Purchases were introduced in 1862 as a way of getting small landholders on the land. They selected a portion of land, paid an initial deposit of %10 of the value, and then had to pay it off. The conditions were that they had to reside on the property, and they had to improve it – build a house, fences, etc. They could select land before it was surveyed, so by the time the surveyor came around there was often some improvements already built, which the surveyor often described and marked on the plan. My ancestor Richard Eason (1829-1922) selected some land near Blayney in 1871. The land is Portion 199: 40 acres in the Parish of Graham, County of Bathurst, which is just north of the town of Blayney in New South Wales. Historical parish maps can be viewed on the Parish Map Preservation Project website. The names that appear on the maps are those of the first title holders. Conditional purchasers could take 30-40 years to finish paying the land off, and if there was a mortgage involved then the bank became the first title holder. Later maps of this parish show the City Bank of Sydney on this portion. The register gives a summary of the history of the purchase up until the title was issued by the Registrar General. Transfers of ownership to mortgagees can be seen, as well as the transfers back to Richard when he discharged the mortgage. Each of these transfers required a separate form to be filled in, and these forms are part of the correspondence for the purchase. You can get quite a bit of information from the register, but if you want the actual documents you have to go further and trace the correspondence through the Correspondence Registers. It sounds easy but it is quite time consuming, and easy to make mistakes and lose your way. You must write down each document number recorded in this register, and then find each one in the relevant Correspondence Register to find out what happened to the document. It was either put away or filed with another document. If you are lucky, all the documents will be filed together and you will eventually find where they are. If not, you have to find and retrieve each one separately. If you are very unlucky, you may lose the trail and be unable to find the document, or the document may have been misplaced. 1871 – a letter from the surveyor in which he describes the improvements made by the applicant and the land contained an extra 6 acres and 3 roods, which the applicant had agreed to pay for. 1897 – Notification of Alienation of the land to Richard Chambers (his older sister’s nephew). I believe this to be the result of a mortgage. The land title was eventually issued in 1916, at which point the entries in the Conditional Purchase Register end, as control was passed from the Conditional Sales Branch to the Registrar General. On the map you can see many other names of the people that Richard must have known. Robert and William Ewin were his brothers-in-law. A sister-in-law married a Thornberry. The Easons, Ewins and Thornberrys all came from the same couple of parishes in County Tyrone in northern Ireland. Richard built a house on this land and raised his family in it, even though his wife died not long afterwards. His son John raised his own family there. John’s son Richard, my grandfather, sold the land and took the materials for his own building. A couple of years ago I visited this land and saw the remains of the house. I have written about this previously. I met the current owner of the property, who gave me a photo of Richard’s son John Eason, my great-grandfather, that I had never seen before. I’ve traced many conditional purchases since then, but none have been as exciting as this first one for my great-great-grandfather! This post is based on a post previously published for Australia Day 2011 on my blog Carole’s Canvas. The Family History Library has a good selection of documents available for land and property in Fiji. Not all are available at Family History Centers in Fiji. Here is a selection of the documents relevant to historical research. Certificates of title for land Fiji. Registrar-General’s Office. 36 microfilm reels. Original registers to 1970, 400 titles per reel in title number order. Crown grants of land Fiji. Registrar General’s office. 4 microfilm reels. Original registers to 1970, 300-450 grants per reel in grant number order. Crown lease records for Fiji 1889-1989. Land Titles Office. 16 microfilm reels. Original documents ordered chronologically, although some years filmed out of sequence. Films 1817426-1814741 inclusive. Fiji, minutes of the Executive Council sitting for the rehearing of claims to land … 1879-1880. Fiji Executive Council. Filmed by the Pacific Manuscripts Bureau in 1973 (PMB Manuscript No. 206). 1 microfilm reel. Film 1341264. Land deed books for Fiji 1879-1990. Land Titles Office. 8 microfilm reels. Original documents ordered chronologically, although some filmed out of sequence. Films 1817418-1817424. Native land records 1890-1980. Native Lands Commission. 107 microfilm reels. Original records at the Ministry of Fijian Affairs. See separate post.